The foundation of the website builder dates back to 2003. This is when the developers of the platform – Craig and Mike – decided to build a one-of-a-kind eCommerce solution that would encompass the top notch features and tools of the systems they have previously worked on. Thousands of web stores have been built with PinnacleCart already and many more are currently under the development. Thus, the software was used to launch unique storefronts for many renowned clients, including Schuremed, QBG Brands, International Health, UFC, NBA, HBO, A&E, Discovery Channel, among many other notable companies. At first glance, PinnacleCart seems to be quite a complex system. The dashboard interface is well-structured and has a rich number of settings. It may seem complicated for newbies, but only during the first day of usage. As soon as you get used to the service, it will become understandable. You don’t have to look for the elements you need. They are always at hand, so you can just do what you have to do. This is quite convenient, but you will still need time to master the dashboard. PinnacleCart comes with an extensive knowledge base and detailed video tutorials that cover the more complex steps of the online store creation process. This set of resources helps boost your overall comprehension of their service and eCommerce, in general. Apart from that, you can get in touch with the customer support team or use the contact form to find out anything you need. The specialists working for the service will provide you with quick and qualified assistance. To sum it up, you are not likely to face problems when studying PinnacleCart. Don’t hurry to contact the support service right from the start. The knowledge base includes answers to over 99% of questions you might have. By exploring it, you will get a nice chance to create a decent online store. This also applies to users who are seeing such a platform for the first time. PinnacleCart can impress everyone by a surprising set of options. This is a functional and serious online store builder used to create and set up nice online stores. It is thought out to the last detail. You will hardly find an important feature the systems doesn’t offer yet. Having entered the dashboard, you will see a rich choice of statistic data, including recent orders, sales charts by time intervals, a list of products, the amount of registered users, new customers as well as feedbacks and product ratings. This is very informative, useful and presented in a simple way. Reviewed below are the major features of the system that make it stand out from the crowd. With PinnacleCart, you can create the unlimited number of products, their categories and subcategories. This subdivision makes it simpler for your customers to navigate the website looking for offers they are interested in. The system also allows migrating your products using CSV files, which saves your effort and time. If you need to track the inventory list to keep control over your product stock and amount of sales, you can make the required settings to get the stock notifications in advance. PinnacleCart makes it possible to list your products in the most world-known marketplaces like Amazon, eBay, Google Shopping, Yahoo! etc. There is also an opportunity to set your Facebook store to grow your client base and boost sales volume. What’s more, you can create discounts and gift certificates in the admin panel. Do you wish to be aware of your customers’ opinions and preferences? Then enable the wish list option to let them save the products they would like to purchase in future. PinnacleCart has the abandoned cart feature that will keep track of the abandoned shopping carts and send the reminders to customers. You can set the admin rights to let all the team members access the account. At the same time, it’s up to you to assign restricted access rights to the admin panel as well as to its different parts to certain co-workers. This depends upon your requirements, ideas and web store design objectives. PinnacleCart lets you sell and manage physical and digital products.There is also an opportunity to enable product reviews so that your customers could share their shopping stories and recommendations. To make the product images more detailed and informative, it is possible to enable extra features like magnification, zoom in/out, image layover, magic thumb and other options. To improve your online store performance, the website builder allows integrating with multiple add ons, extensions and other services. It boasts an extensive set of add ons, which are free and paid. 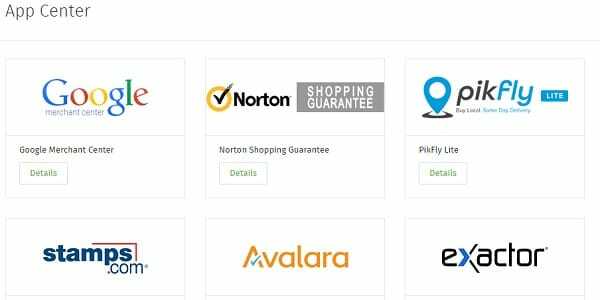 Some of them include: Avalara (for updating of sales taxes), MailChimp (for email marketing), Endicia (eCommerce shipping solution), AddShoppers (for collecting social analytics, tracking ROI, generating reports and sharing data). There are also other add ons out there, which are compatible with the system and can expand its functionality. You can accept credit cards directly on your website and provide the price list in different currencies. There is an opportunity to get real-time shipping quotes by means of integrating with FedEx, USPS, UPS etc. For those users, who wish to pay over time or have the intention to upgrade their accounts, the system makes it possible to enable the recurring billing option. Users will also appreciate an opportunity to integrate with Avalara Ava Tax or Exactor Tax to be able to accurately estimate the taxes. When it comes to effective SEO optimization, PinnacleCart offers a broad range of tools and options. You can write custom URLs, meta tags (titles, descriptions) for products, their categories and web pages. It’s also possible to upload and create robot.txt files and make use of the automatically generated site map. Advanced reporting tools the service offers let you view your sales and website performance reports to make the conclusions. Furthermore, you can control your web store statistics by means of connecting to Google Analytics and Google Adwords. If you don’t have an intention to manage your inventory list on your own, you can make use of Doba integration, which is available at no cost. Doba is a dropshipping system, which grants access to lots of products of wholesalers. It eliminates the necessity to store or ship the products on your own. Customers will order the products at your web store, while the suppliers will take care of logistics. It goes without saying that standard functional features are available here as well. You will get control over the sales and ways of increasing them. This is a great site builder for effective development of online stores, which deserves to be rated high! PinnacleCart comes with 30 readymade templates. You can change them any time you wish. All of them are free. Their quality is standard, while their main feature is the adaptability to the development of large online stores. The attractiveness of the templates recedes into the background, giving place to the right structure. Some templates look appealing, but you will hardly make your choice based on the background color, fonts or attention-grabbing demo-content only. These features can be changed later. What you should choose instead is the structure of an e-store you are going to create. Standard template customization options are superb. You can click any element (block, image, button, title etc.) with a right mouse button in the Cart Designer section and edit visual properties or source code. Choose and set up the fonts and background, add your CSS-styles if needed. PinnacleCart also offers the WYSIWYG-editor, but it is not similar to those available in other website builders. You can edit template blocks by using class selectors. This is how you can quickly add tabs, for example, and fill them with the required content. Apart from that, you can add readymade templates to any place on your webpage (best sellers, recently viewed, view cart, manufacturers etc.) or create and set them up on your own (however, you will need HTML knowledge here). You don’t have to worry about spoiling something at your website when developing it. It is possible to delete the changes and get the standard version of the template. It’s worth mentioning that all the PinnacleCart templates are responsive. This means that your online store will be accessible on all types of mobile devices. The website builder offers vast online store customization opportunities. You don’t have to stick to the design of your template during the website creation process – you can set up all the elements in a quick and simple way, especially if you possess the knowledge of HTML/CSS basics. Even if you don’t have these skills, PinnacleCart will surprise you with the set of customization options. Create what you want – the system allows doing that! By the way, most things are very simple and understandable for the newbies. PinnacleCart involves an extensive knowledge base and a forum to help users handle their problems without customer support assistance. If you still have the necessity to get in touch with the developers, you are welcome to do that by sending the tickets, which are available in the corresponding dashboard section. Customer support service is friendly and outgoing. They are ready to help you with any problem during their working hours, although, there may be certain delays at night. Right after the registration, you will be offered the 14-day trial period to test all the features of the platform. As soon as the trial period is over, you will have to pay for the services of the system or refuse from further usage of it. The cost of PinnacleCart plans is almost on the same level as other e-commerce website builders. It allows for unlimited products and transactions. The software currently offers 4 plans. ✓ Priority Customer Support and Services. for high-volume plans and services. It’s worth mentioning that you can get the 8% discount when paying for one year and 17% discount when paying for 2 years. Whatever plan you go for, you will be offered access to all the dashboard functions. The major difference between the plans, though, is the bandwidth and the amount of storage space. The larger the e-store is, the more expensive PinnacleCart plan you might need. That sounds logical. Included is a free Facebook and Mobile store. 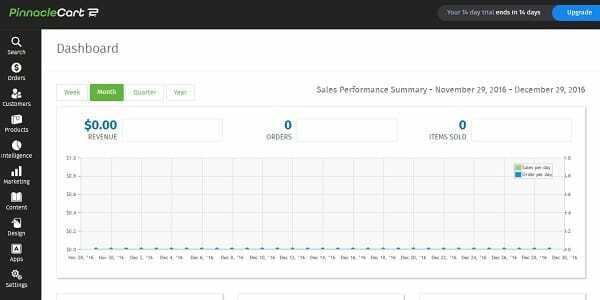 Recapture abandoned carts using their “Drift Marketing” feature. No HTML or CSS editor to manually customize your web store. The disadvantages are not that substantial, but they may have negative impact upon your eCommerce web building experience. 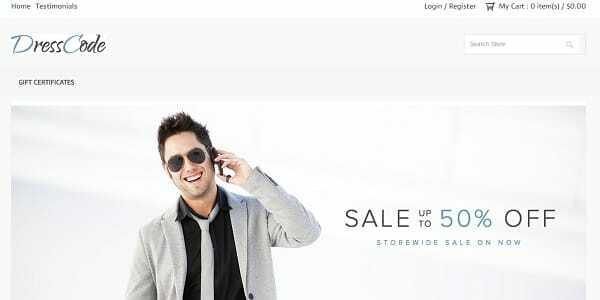 PinnacleCart is a powerful eCommerce software that comes with a broad range of features. Taking into account rich functionality of the service, it is quite simple and easy to master. This makes it a good choice for the majority of users. Many well-known clients use the platform today, which is the best proof of its prevalence over other similar systems. There is hardly an e-commerce task you won’t be able to complete with PinnacleCart. Are you going to create an online store to sell hundreds of thousands of products? No problem! Do you need unique design? You are welcome. Dream of the advanced marketing? That’s not a problem as well! The service has everything you need, if not even more. Do we recommend using PinnacleCart? The firm answer is: Yes! Explore its benefits at the trial period and start creating your own commercial empire. Good luck!